Te Papa vertebrate curator Dr Colin Miskelly recently spent 10 days at Punakaiki (on the West Coast of the South Island) as part of a Te Papa seabird research team. 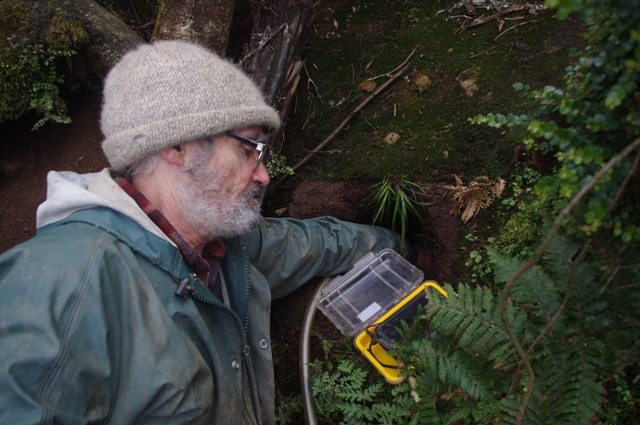 This blog reports on what the team found underground within a specially protected area of Paparoa National Park. As described in previous blogs in this series, a burrowscope is a high-tech tool used to view the contents of burrows, and is similar in design and function to an over-sized endoscope. The camera lens is on the end of a long tube, and is surrounded by small infra-red light sources, meaning that the image produced is in black-&-white. Burrowscopes are widely used in conservation research and management in New Zealand, particularly in studies of burrow-nesting seabirds. New Zealand has far more breeding species of petrels (including shearwaters and prions) than any other nation, and 33 of our 37 breeding species nest in burrows. At least a dozen species of petrels bred on the New Zealand mainland before people arrived, but almost all became restricted to offshore islands due to predation by introduced rats, cats, stoats, ferrets and pigs. 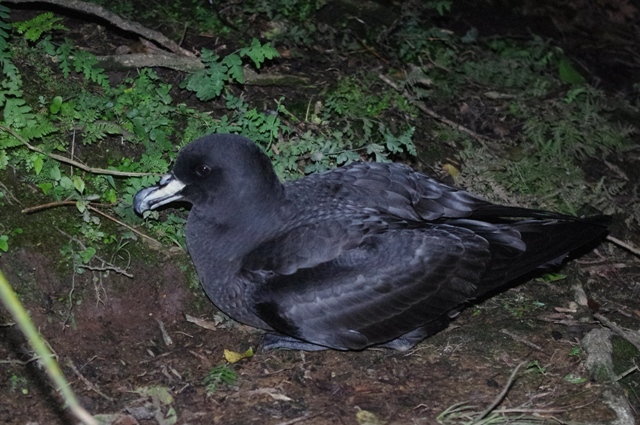 One of the few petrel species still breeding on the mainland is the Westland petrel, which breeds only in coastal forest in and near Punakaiki National Park. One of the reasons that it has survived so far is that the adults are large (about 1.2 kg) and aggressive, which also makes them a challenging species to study compared to their smaller cousins. Most petrel species, including Westland petrels, return to their breeding colonies under the cover of darkness, to avoid the attentions of predatory birds that hunt in daylight (e.g. falcons, harriers, skuas, gulls and weka). 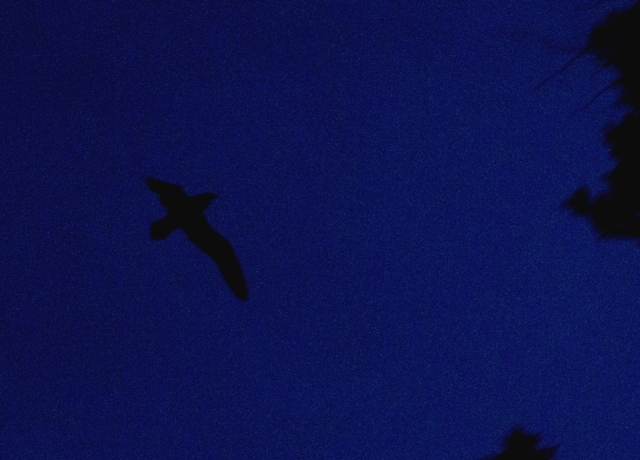 Unfortunately, the cloak of darkness does not protect the birds from introduced mammals, many of which hunt by scent at night. Westland petrels excavate burrows with their robust beaks and powerful, clawed and webbed feet. By day, the colony appears like a deserted rabbit-warren under the tall forest, with just the occasional call from a bird underground, disturbed by our footfalls. But by night, the forest is full of their loud staccato calls as young birds seek to secure a burrow and mate for the following breeding season. 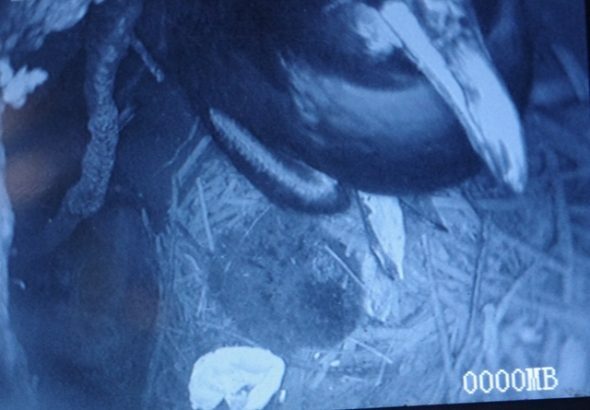 During our visit in mid July, most pairs were taking turns to incubate their single egg. 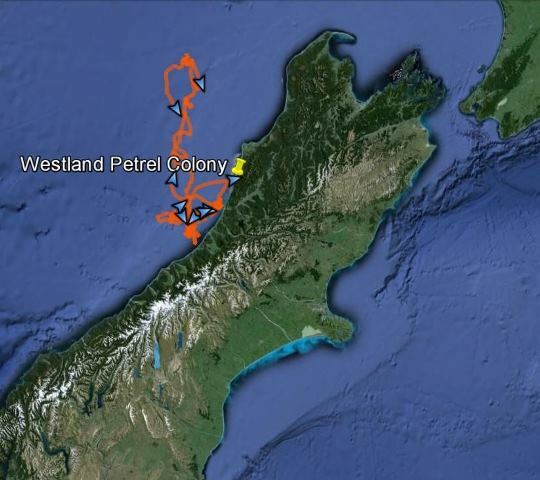 Our main task was to retrieve GPS data-loggers that had been attached to 24 breeding adults during the Te Papa team’s previous visit a month earlier (see ‘Related blogs’ below for information about tracking the movements of Westland petrels at sea). One member of each study pair had been marked with white animal-friendly marker on their head. We used a burrowscope to identify which bird was present, checking each nest daily until the bird carrying the data-logger returned to take its turn incubating the egg. The data-logger was then removed from the bird’s back, so that the data accumulated over the previous 4-5 weeks could be down-loaded. 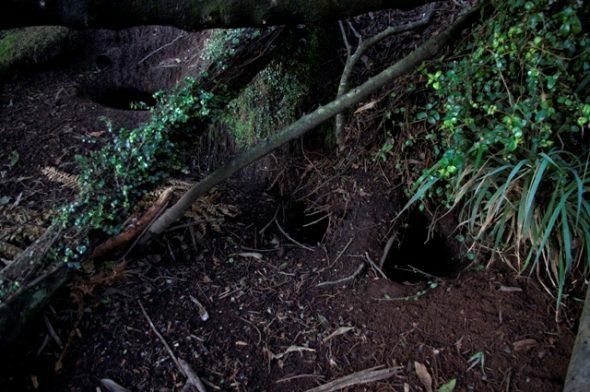 Unlike previous blogs in this series, we did not find any other species living in the Westland petrel burrows. On the islands visited in blogs 1-5, the burrowscope revealed a variety of petrel species breeding in mixed-species colonies, as well as penguins, tuatara, skinks, geckos, land snails and large weta living in burrows excavated by petrels. This lack of variety in Paparoa National Park reflects the impact of introduced predators on mainland ecosystems. But the burrowscope did produce one surprise – a recently-hatched Westland petrel chick, which was a week or so earlier than expected. 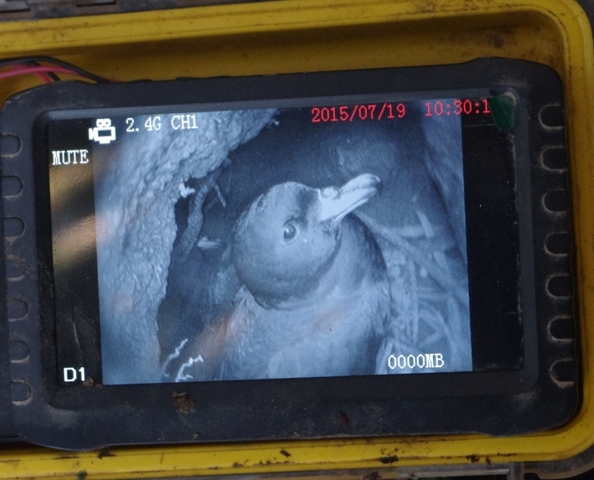 The GPS loggers that we retrieved from the birds revealed where these breeding birds had been foraging while their mate took their turn keeping the pairs’ egg warm in the burrow. The track below is from a male that was fitted with a logger on 15 June. He left the colony on 19 June and went to sea for 9 days, returning on 28 June. He spent the first 7 days at sea offshore from Hokitika, mostly within 30 km of the coast, then flew 200 km north for a day before returning to the colony. Wonderful blog. A great opportunity to share burrow life. 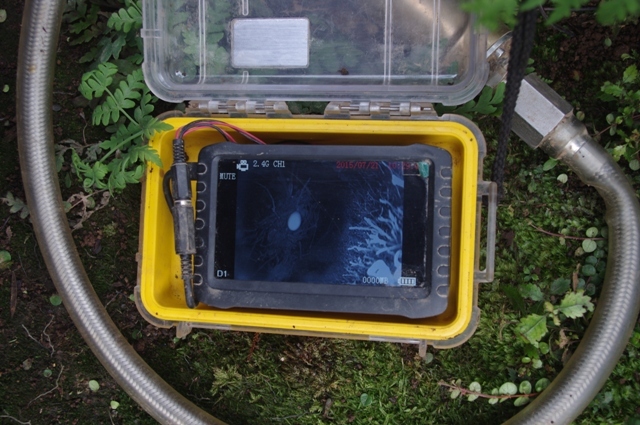 I liked the foraging track image, too.